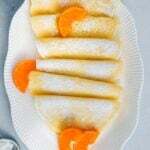 Very thin gluten free crepes made with rice flour. Whisk all the ingredients in a large bowl. Heat a non stick pan and add 1 teaspoon butter in it. Let it melt and cover the bottom of the pan with it using a brush (See the video). You won’t need to butter the pan each time. This is just for the first crepe. Using a ladle, pour batter in the center of the pan and roll the pan from side to side to give the batter a round shape. Cook it for 1 or 2 minutes or until the top of the batter has bubbles and it’s not wet any longer (See the video). Flip it to the other side and cook for another minute. Transfer it on a plate. Repeat the same steps until you finish all the batter.